By Brenda: One of the most natural and accurate forms of Divination is Scrying. Scrying is the art of “seeing” through a specific medium. Natural mediums such as water, smoke and oil were among the first used by the ancients as far back as when the first Hunter Gatherer tribes roamed the earth. In the vast arena(the nature), early humankind may have gazed into a still pond of water, watched the patterns of the ripples or of the way the clouds were reflected on the water. In this medium, they saw symbols that related to their lives and their connection with a supreme deity. Later, as humankind advanced scrying, techniques evolved as well. The ancient Egyptians and Babylonians were known to scry in the fire and smoke of oil lamps. Magical symbols and spells were often written on the linen wicks as a method of conveying their desires to the Gods. The ancient Romans scryed be means of Augury a method in which the entrails of a sacrificed animal were read for auspicious signs, Roman emperors even had a royal Augerer appointed to their courts. As a psychic, I became fascinated with scrying. I have explored many methods beginning with the Crystal Ball which I found to be a challenging tool at first. Looking into the crystal or crystal gazing I soon realized was not a matter of concentration like with the gypsies in the movies. Rather crystal gazing required confidence and patience. With patience and in a meditative state, images will start to appear. They cannot be forced and however fantastic the image may be your first impression is always the right one. 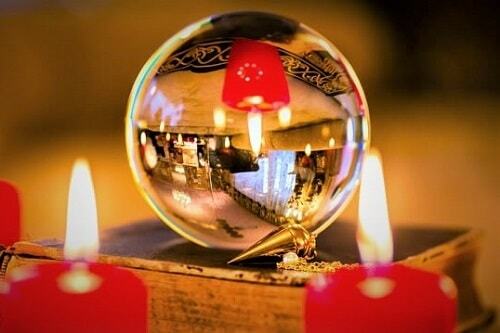 Sometimes the crystal ball will “cloud over” then reveal an image. The same holds true for other scrying tools such as the Black or Magic Mirror, the Water Bowl and Show Stone. Scrying with fire takes the form of candles, oil lamps and even cauldrons where the images are seen in the way the smoke rises or within the center of the flames. Cauldron gazing makes use of the smoke, fire and smoldering ashes to reveal images of the past present and future. In practicing scrying, a sense of the divine can be felt as well as a connection with the superconsciousness. In which lies universal truths. The best time for scrying is when you are relaxed and in a meditative state where you will be most open to receive messages. A good rule of thumb is to keep a notebook with you to record the images. Images that at first may not mean anything but upon further contemplation could represent a startling prediction. Preparation for learning scrying can start simply with a walk in nature. Observe the cloud patterns, ripples in the water of a pond or stream and even in the patterns of birds in flight. The art of scrying always starts first with your sense of connection with the world around you. 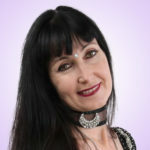 Only through that realizations can you successfully interpret your scrying tool and its purpose as a connection to the Divine source. This entry was posted in Mediumship and tagged Connection, crystals, Divination, Divine Source, mediumship, Reading Tool, Scrying on December 19, 2018 by Brenda.